As a nursing mother I am all about finding ways to nurse in public without making it obvious or offensive. 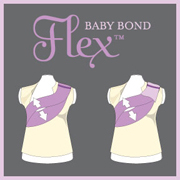 I reviewed the Baby Bond Flex Nursing Sash. I tried the sash at my house while visiting with family in hopes to stay in the room and hold a conversation instead of leaving the room like I normally do when nursing. It was a little tricky at first to make sure that I was completely covered and my son was latched on because the sash seemed a little thin in width. I adjusted the sash on both sides and once that happened the sash felt comfortable and my son was very happy to nurse and still visit with family. I did find the sash to be a bit too revealing to use in crowded public places. The times when my son wasn't completely latched my breast was just kind of out there, for me I was not comfortable but I am sure other moms would find the sash comfortable. I like that you get the same coverage with the Nursing Sash as the other covers that are so large they seem to emphasis the fact that you are nursing. I would recommend the Baby Bond to moms who are already comfortable with nursing in public. My favorite part was The Nursing Sash comes in a cute little matching tote along with a burp cloth! If you would like more information about Baby Bond you can visit their twitter and facebook pages. This review was written by a new reviewer who has join the Bee Hive and I appreciate her hard work in helping with reviews. More of her reviews, parenting stories and tips to come!